I bought a set of texture plates recently, and then sat there trying to figure out why I had wanted them! In typical fashion, I got interested in the tool before I had thought through the results. But with a little experimenting, I found out that there are a whole host of things you can use these for…besides using them for interesting water glass coasters! The old classic is to place a thin paper overtop of the texture and rub with crayons, pastels, chalks, or colored pencils. This is one of the easiest ways to add texture to your work, building up layers of rubbings and then overstamping or painting. 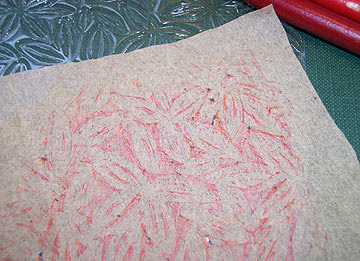 Crayons will act as a resist, so you can add water media on top and still see the pattern you’ve made. If you use a crayon that matches the color of the paper, or a clear wax stick (even a candle), the paper will show through. To texture a small shape, you can either go ahead and texture a larger piece of paper and then cut out your shape, or you can cut it out first and use a small piece of double-sided tape to hold it in place while you rub. Consider adding texture just to specific areas of your work. For example, you might want to draw a bird and add rubbed texture to just the wings, or just the breast and head, etc. 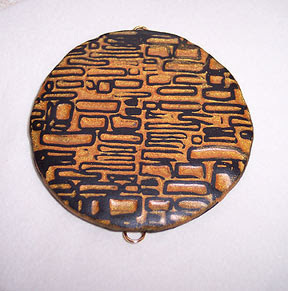 Use texture plates to add a design to clay. Sprinkle a little cornstarch on the texture plate to keep it from sticking to polymer, and use olive oil to prevent it from sticking to metal clays.